The Daniells are renowned for their authorship of 'Oriental Scenery', a collection of aquatints of views of India in six parts published between 1795 and 1810. 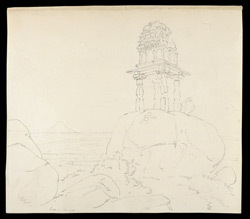 This is a sketch of the small temple pavilion in Gavipur crowning a rocky outcrop in the foreground of Oriental Scenery V, 17 ('View near Bangalore'), but from a different angle. The artists wrote, "The neighbourhood of Bangalore is remarkable for the frequent appearance of the remains of antient Hindoo architecture...on the right is a pavilion very neatly executed, which probably was the place for exhibiting to the multitude the idol belonging to the adjoining temple."